President Trump's U.S. EPA transition leader Myron Ebell wants to see the agency's staff cut to about one-third of its size. Photo courtesy of the U.S. Senate. The leader of President Trump's U.S. EPA transition team wants to see the agency's 15,000-person staff axed to about 5,000 employees. "I think getting down to 5,000 in the first term is a goal," said Myron Ebell of the Competitive Enterprise Institute, who headed the Trump team preparing for the administration changeover at EPA. With his transition tenure over, Ebell cautioned that he was speaking for himself, but he pointed to Trump's comments as a presidential candidate that he wanted to eliminate EPA. Trump has since said that he wants to "refocus the EPA on its core mission." "President Trump during the campaign identified the EPA as a major obstacle to economic recovery and growth and he said that he wanted to either abolish it or leave a little bit," Ebell said today in an interview. "He's not going to abolish it in a year; he's going to take a while or leave a little bit. The first thing that's going to need to be done is to start downsizing the agency." Ebell's comments come as workers at EPA and other agencies across government brace for major budget cuts. One of Trump's first actions as president was to freeze federal hiring, and his first budget blueprint in the coming months is likely to offer a comprehensive look at what environmental programs he wants to scale back or eliminate. Slashing EPA's staff to 5,000 would put the agency close to the numbers it had when it was created by President Nixon. EPA started with about 4,000 employees in 1970. But in recent years, the staff has hovered between 14,000 and 18,000 employees, with an annual budget of about $8 billion. 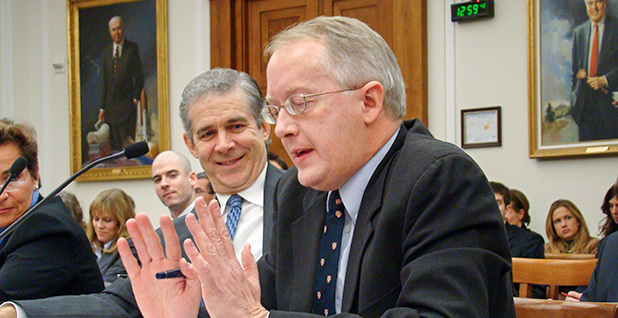 Ebell's goal would cut EPA's staff to about a third of its current size. "I think it's a very steep goal," he said. "If you're going to get anywhere, you've got to have high aspirations." Ebell, a vocal critic of the EPA's policies under President Obama, said he sees some obvious places for cuts. Much of EPA's budget passes through the agency toward clean water and clean air programs that are run by the states. "That raises the question," Ebell said. "What are all these people in the EPA air and safe drinking water offices doing?" And he said the Obama administration's move to put air staff into a climate program was an indication that they weren't needed in the air office. "It seems to me that there are real opportunities for cuts there," he said. Ebell would also like to see EPA's regional staffs cut back. About half of EPA's staff is located in 10 regional offices throughout the country. Those offices "can be cut significantly over time," he said. Such drastic cutbacks would be certain to spark an outcry among environmentalists, federal workers and others who are already mounting their opposition to the Trump administration (see related story). Christine Todd Whitman, who was EPA administrator in President George W. Bush's first term, said staff cuts along those lines would mean the agency couldn't do its job "the way it should be doing it or has been doing it." In the regional offices, she said, staff are needed "to be able to try to meld the programs to work for the challenges in that individual state." Broadly, Whitman said, she finds the Trump administration's early actions toward EPA "very troubling." "I've been worried from the very beginning that this was the one area that the president was going to keep his campaign promises without changing them much," she said. "This is an area where I think he is absolutely focused and determined and he doesn't like regulation." Ebell said the new administration has been unfairly criticized for scaling back social media and pausing some spending. "The fact is that every transition involves taking control of the communications operation, the regulatory pipeline, the spending, the grants, the contracts," he said. "I think that the environmental community is trying to find anything that they can throw against the wall if something sticks," he said.